After months of protests, Ukraine slipped into violence last week as government forces attacked protesters in Kyiv. Then, in a frantic 48 hours, President Viktor Yanukovych’s government collapsed, rival politician Yulia Timoshenko was released from prison, and Yakukovych fled into hiding. It was a stunning victory for the “maidanovtsi”, those protesting on Kyiv’s Maidan and those supporting the protesters around the county and the world. I’m reading Bruce Bueno de Mesquita’s The Predictioneer’s Game, which is about analyzing incentives to make political forecasts. This book got me thinking about Ukraine. Why did Yanukovych fall? Sure, he was corrupt, but so are many leaders in the region. What happened in Ukraine was very complex. But it seems to me that at a basic level, the obvious corruption of the Yakukovych government, combined with Ukraine’s relatively open and democratic society, led to an unstable situation. It is instructive to divide this plot into quadrants. The lower left quadrant shows those countries that are both very corrupt and authoritarian. These governments have survived very high levels of corruption in part because they resort to anti-democratic means of staying in power, such as restricting citizens’ political and civil rights. The upper right quadrant contains nations with lower levels of corruption and authoritarianism. Chief among these are the Baltic states, which have enjoyed a high degree of stability. Georgia, although it experienced a revolution in 2003, has been more politically stable in recent years. The lower right quadrant is a null set. We just don’t see countries that are very authoritarian but not very corrupt in this region. An example of a non-Eurasian country that sits in this quadrant would be the United Arab Emirates. And then there’s the upper left quadrant: states that are less authoritarian but have high levels of corruption. Countries occupying this space have experienced lots of political instability. Kyrgyzstan has had two revolutions in the last decade: the Tulip Revolution of 2005, and the more violent second Kyrgyz revolution in 2010. Moldova suffered widespread unrest in 2009 (the so-called Twitter Revolution), although recent trends point to a more democratic and pro-European direction. And Ukraine had the Orange Revolution in 2004 before the political order was upended again last week as a result of Euromaidan. Of course, there are many other factors that determine how likely a government is to fall. Economic growth and inequality surely play a part, as do the personalities and governing styles of individual leaders. Yakukovych, for example, was indecisive and incompetent, and many of his allies quickly abandoned him. So what are the lessons here? Well, if you are going to blatantly siphon money away from your constituents while ignoring many of their basic needs, you better rule with an iron fist. If not, they are going to rise up and throw you out. Or better yet, don’t run a corrupt regime in the first place. The events in Ukraine illustrate how a relatively democratic society, with a strong civil society and a (mostly) free press can be an important check on corruption in government. Although far from being “fully democratic” in the eyes of international indices, Ukraine was democratic and open enough for Euromaidan to take root and ultimately succeed. What if Ukraine split in two? If you’re interested in Ukraine, you are probably aware of the country’s east-west political and enthno-linguistic divisions. I wrote about this in a couple of recent posts. Not long ago, I began to wonder what Ukraine would look like if it split into two nations. Now, I don’t think this is going to happen, nor do I think it would be in the best interest of Ukraine. But with protests continuing in Kyiv and in many of the regions, it’s worth investigating what these two hypothetical nations would look like. There is a sharp break where the vote share jumps to above 50% – a natural place for the division. Incidentally, it is interesting and unexpected that Zakarpatskaya region, in the far west of the country, had the highest level of Yanukovych support of all the Timoshenko-majority regions. What is going on there? West Ukraine is a bit larger, and has a slightly higher population – ~24 million versus ~21 million. It’s landlocked, and shares borders with all of Ukraine’s current neighbors. East Ukraine has a higher per capita income, and occupies all of Ukraine’s Black Sea Coast. The chart above illustrates some additional features of the countries. East Ukraine is much more urban than the west, and contains many more Russian speakers (although it has a large minority of Ukrainian speakers). West Ukraine has a much smaller minority of Russian speakers. I encourage you to take a look at the entire interactive visualization in Tableau by clicking on the image below. 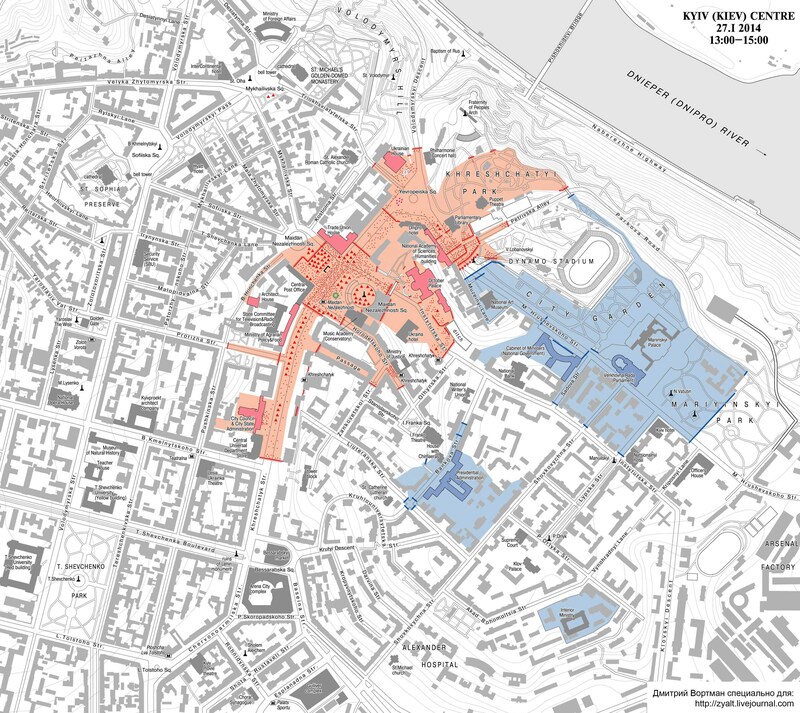 Here is an incredibly detailed map of the situation in Kyiv as of January 27. It comes from Dmitri Bortman and was published on Ilya Varlamov’s livejournal page, which has lots of on-the-ground details about what is happening on the Maidan (central square and environs) in Kyiv. If you want to read about what it’s actually like in Kyiv right now and see some amazing pictures, have a look at this recent post by Varlamov. Basically the reddish shading shows the area occupied by the protesters, and the blue shading shows land occupied by government police forces. 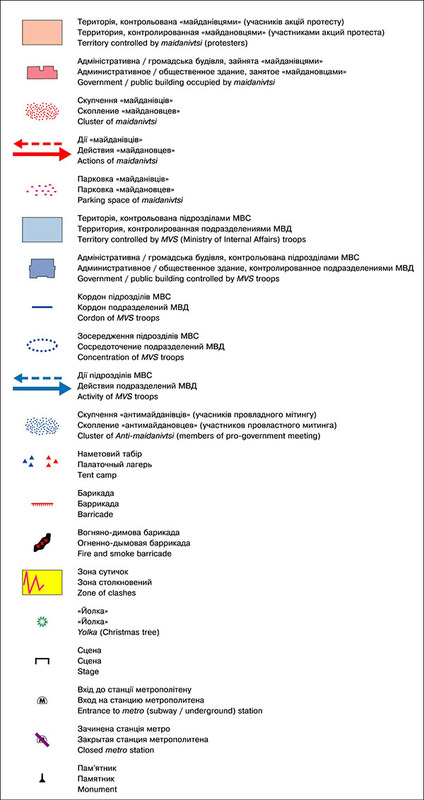 The red lines show barricades built by the protesters to keep riot police from clearing the demonstrations. The red dots give an idea of the density of clusters of protesters. Here’s the legend. Last week I wrote a post about Ukraine’s stark regional differences in language, ethnicity, and politics. There was a fair bit of interest, so I found some more data on regional demographic, ethnic, linguistic, and economic indicators in Ukraine and played around a bit in Tableau. I produced this interactive graphic, which illustrates the results of the 2010 presidential election for each region and presents some indicators that were correlated with support for Viktor Yanukovich (native Russian speakers, ethnic Russians, urban population, and average wage). I hope to play around some more with these regional data. What sorts of illustrations would you be interested in seeing? And if you just can’t get enough of Ukrainian regional geography, this guy is the man! Note: I now have a new post on Ukrainian political geography complete with an interactive graphic. If you’ve been following the news, you know that Ukraine is experiencing mass protests and civic unrest. The situation seems to be coming to a head today, with riot police threatening to break up demonstrations in Kyiv and President Viktor Yanukovych talking about meeting with opposition leaders. The protests were triggered when Yanukovych backed out of signing an agreement with the European Union that would increase trade and political cooperation. Things got worse when police beat some unarmed protesters last week. Ukrainians are generally fed up by lack of economic opportunity as well as pervasive corruption, and many seem happy to take to the streets. Why would Yanukovych refuse to sign the EU agreement after previously promoting it, knowing that it would make a lot of Ukrainians unhappy? Well, the standard answer is that Russia put enormous pressure on Ukraine, including threatening economic retribution. And that’s true. But to grasp why Yakukovych felt comfortable making this decision, and why Russia has such an outsized influence on the country, you have to understand how Ukraine is ethnically, culturally, and linguistically divided by geography. The map above shows the percent of ethnic Russians in each of Ukraine’s oblasts (regional administrative units. About 17 percent of Ukrainians identify as ethnic Russian (2001 census), but they are clustered in the east and south of the country. There is a very sharp drop off in the number of Russians to the north and west of this dividing line, for example from 25.6% in Kharkov Oblast to 7.2% in Poltava Oblast. There are many historic reasons for this ethnic divide, including migration from Russia in Soviet times to industrial regions in eastern Ukraine, but we won’t get into that now. Percent of Ukrainians by Oblast whose native language is Russian. About 30 percent of Ukrainians identified as native Russian speakers. But ethnicity is really only a minor part of the story. 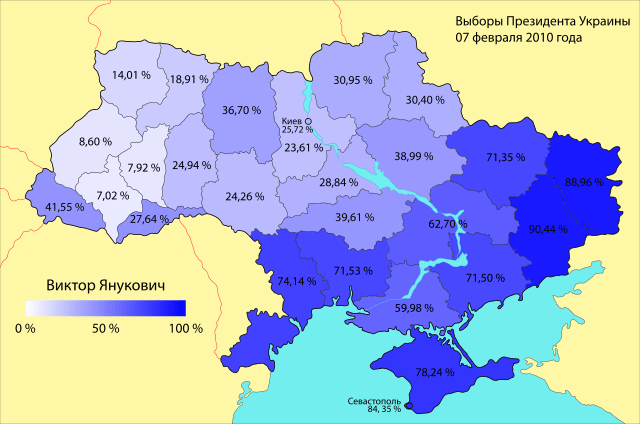 The map above shows the percentages of Ukrainians whose native language is Russian. Again you can see the stark divide separating south and east from the rest of the country. Comparing with the ethnicity map you can also see that many Ukrainians who are not ethnic Russians speak Russian as their native language. Dominant language at the raion (sub-regional) level in Ukraine. Blue is Ukrainian. Red is Russian. When you look closer, at the sub-regional level, you can actually see that Russian language is concentrated in Crimea and in the large cities and industrial areas of the south and east. Rural areas in the east are predominately Ukrainian speaking. This reminds me of election maps in the United States where Democratic votes are concentrated in dense urban areas, meaning that the map might be awash in a sea of Republican red even if the Democrats won. Percent of the vote by region captured by Viktor Yanukovich in the 2010 presidential election. This ethnic and linguistic divide coincides with a cultural and political divide. The map above shows how much of the vote Yanukovich got in each region in 2010. Even though the election was decided by only about 3.5%, Yanukovych didn’t even get 10% in some areas of western Ukraine while he carried over 90% in Donestk Oblast (where he is from) in the east. That’s a geographically divided electorate! Eastern and southern Ukraine, especially urban areas, are ethnically, linguistically, and culturally closer to Russia than the other parts of the country. This divide is stark. In my experience as a Peace Corps volunteer working in all-Ukraine summer camps, it was not uncommon for many of the young people to have never met someone from the “other” region. Yanukovych and his Party of Regions have their power base in the east and south, and their supporters are much less likely to be upset at forgoing closer relations with the EU, and much more likely to favor closer relations with Russia. Moreover, the economic threats allegedly made by Putin would have affected the pro-Yanukovich regions more because they are industrial areas that sell lot of goods to Russia. So Yanukovych choose a course of action that paralleled the wishes of his power base and his geographic region of support. It remains to be seen whether this was a wise political decision for him, but at this point it does not look good. Perhaps Yanukovych overestimated the cultural and linguistic divisions in Ukraine, and did not account for the fact people all over the country are unhappy with the regime, generally perceived as corrupt and ineffectual, and with the economic situation in the country as a whole. Update: Just an couple hours after I posted this, the Washington Post WorldViews blog published this article. It makes many of the same points regarding the ethnic and liguistic divides in Ukraine and includes some interesting recent polling on the EU integration agreement.